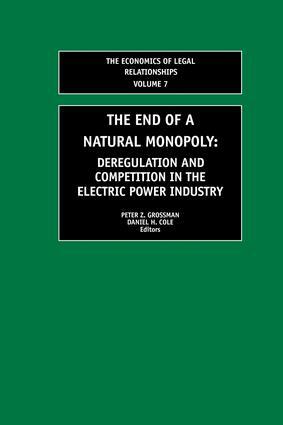 This book addresses the fundamental issues underlying the debate over electric power regulation and deregulation. After decades of the presumption that the electric power industry was a natural monopoly, recent times have seen a trend of deregulation followed by panicked re-regulation. This important book critically analyses this controversial area from a legal and economic perspective. Routledge are proud to be the publishers of the prestigious series The Economics of Legal Relationships, which is sponsored by Michigan State University College of Law, and which continues to be edited by Professors Nicholas Mercuro and Michael D. Kaplowitz of Michigan State University College of Law, USA. This series, with a fine back catalogue of books, is dedicated to publishing original scholarly contributions that systematically analyze legal-economic issues.